You have no doubt been stockpiling Easter Eggs for the past few weeks and kudos to you if they are all still in tact! I have noticed a couple of our have gone walkabouts and there can only be one culprit considering I’m currently following the keto lifestyle! When all the chocolate has been eaten though, what do you do next? Keep the Easter buzz alive by getting creative with special Easter crafts that can be kept and enjoyed long after all the Easter chocolate has disappeared! Liv loves to craft and is forever drawing and cutting out, so we jumped at the chance to try out the Easter crafts available in Home Bargains currently. There really is so much choice, but you can start off with easier crafting, making pictures with stickers and pompoms – we shall certainly be drawing bunny rabbits and using pompoms for their tails. If you are planning an Easter Egg Hunt, then Home Bargains will have you totally covered! Not only can you purchase Easter Eggs and other Easter confectionery, but you can also pick up signs to use on your hunt as well as super cute little buckets and baskets to place all your goodies! To partake in the Easter Egg Hunt in style, check out the ‘Create Your Own Easter Bonnet’ set which comes complete with Easter accessories to adorn on your bonnet. We are huge fans of Home Bargains and use it as my first base for crafting supplies – the prices are very reasonable and as you can see, the easy to make craft kits are awesome! Containing everything you need to make a lovely keepsake, the kits make tidying afterwards a little easier! For more craft inspiration, check out this wonderful post from The Bear And The Fox, featuring a how to guide on making daffodils from cupcake cases – a wonderful Easter craft that will certainly brighten up your house! 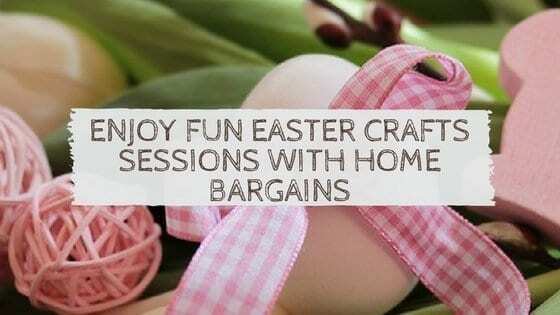 Happy Easter and enjoy crafting! Home Bargains have some wonderful items – I do love a good browse around the shop and never leave without buying more items than expected!